1. Go to Services > User portal > Groups access. • Group — From the drop-down menu, select the user group that will use this portal. 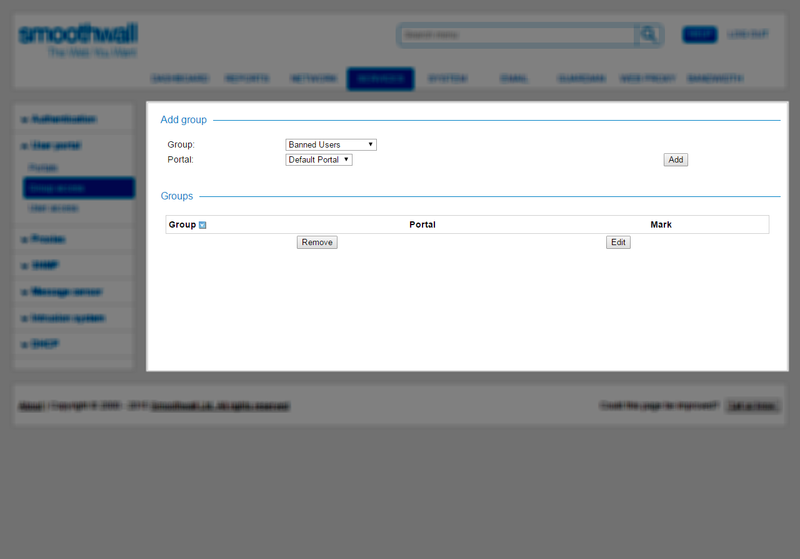 For more information about configuring groups, see Managing Groups of Users. • Portal — From the drop-down menu, select the portal that this group can access. Note: For Multi-Tenant licensed systems, if a user portals’ tenant administrators are members of the same group, that is, either a local Smoothwall group or a directory services group, you can provide access to the group as a whole. However, it should be noted that all members of the group have access to the user portal. As user portal data is restricted on a tenancy-basis, members of groups used by multiple tenants may have access to the wrong tenancy data.